This incredible building is the former estate of Mary Scott Townsend, completed in 1901. The architects are famous for the New York Public Library and many other important American buildings. 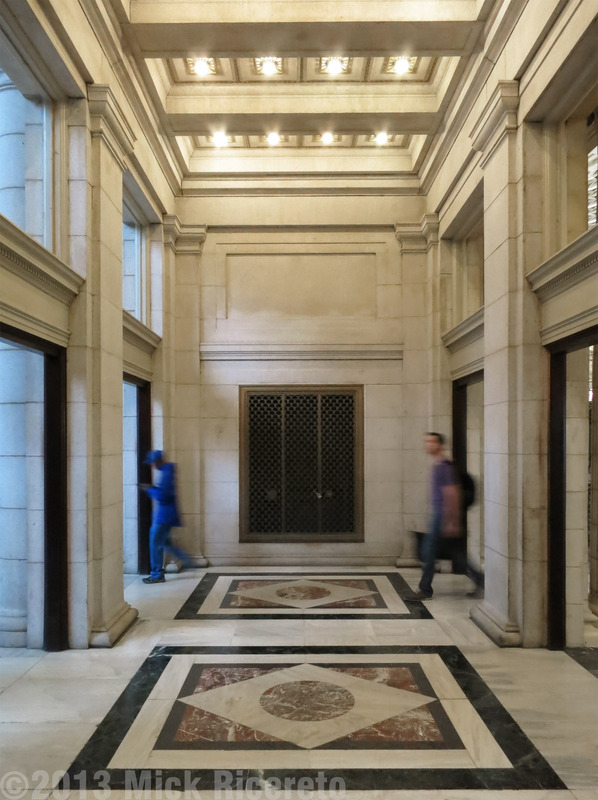 Carrère & Hastings were a very successful firm, focusing on commercial buildings in the Beaux Arts style. 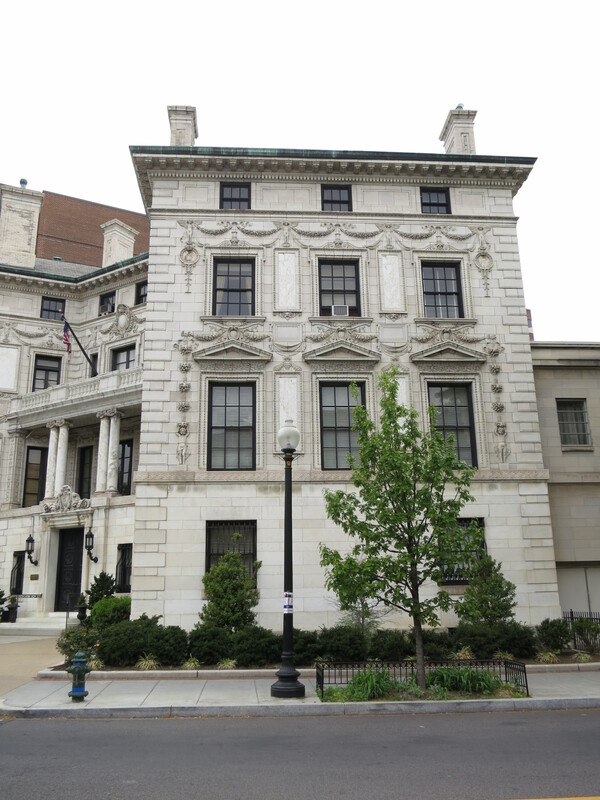 This property was acquired by the Cosmos club – dedicated to “The advancement of its members in science, literature and art” – in 1952. 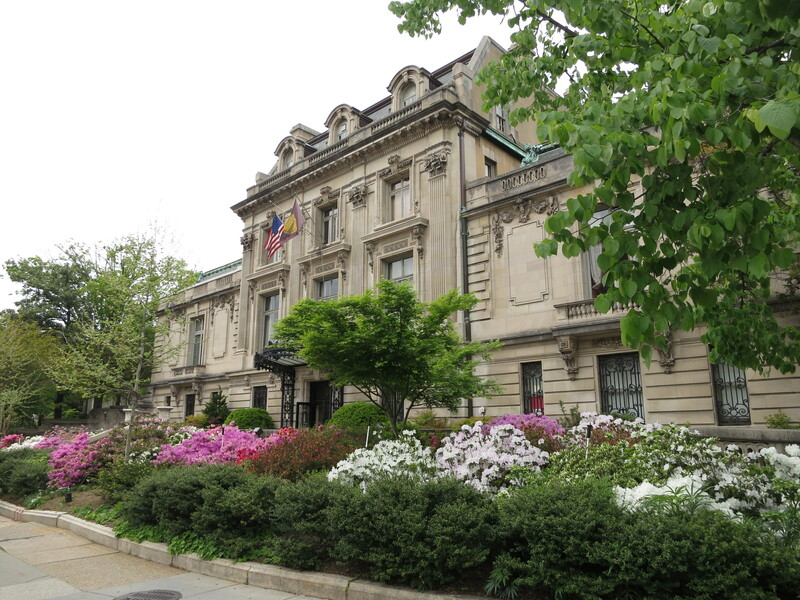 The address is 2121 Massachusetts Avenue NW. 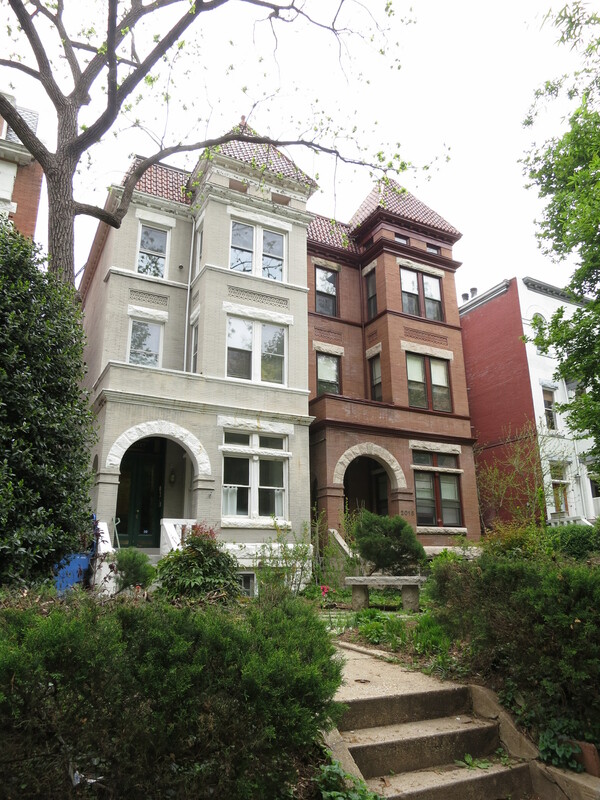 A pair of typical DC row houses. This facade is fairly consistent throughout the city, very often in brick and sometimes stone. The house to the left would have been painted at one time, which is fairly common and gives the street scape an eclectic feel. 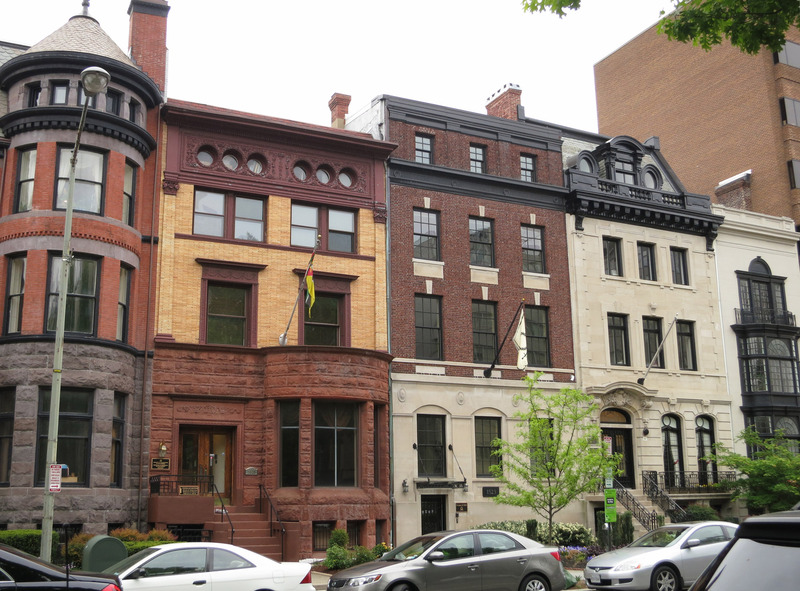 The most noteworthy (and completely typical) feature is the square breakfront; DC row houses employ a sculptured facade almost by rule. 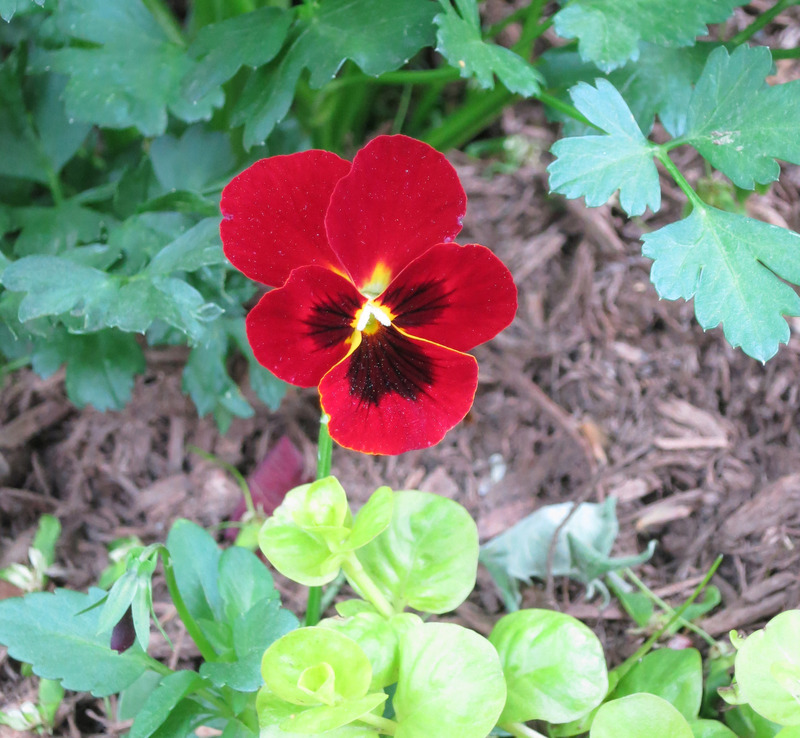 A little up the road, just this lone impatiens. An embassy building. I didn’t get my notes correct, but I do remember this being a South American government/cultural building. Anybody recognize the flag? Across the street, this great old apartment building, also in buff brick. 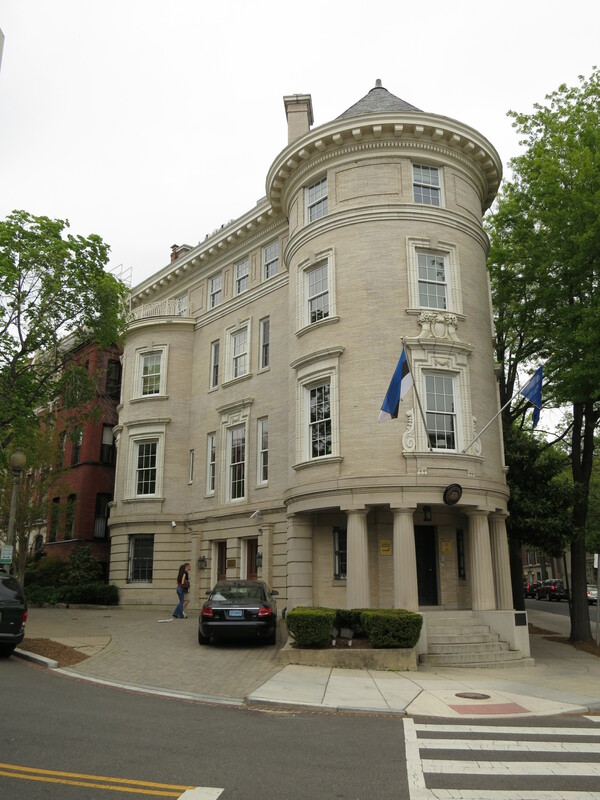 Turrets are common in the District. 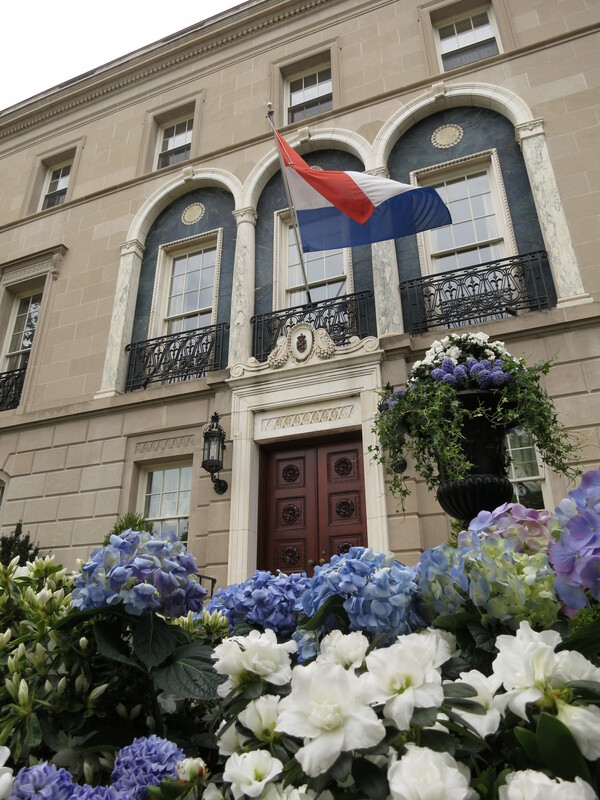 The Dutch embassy. The hyacinths were in full bloom and smelled wonderful! I expected some orange flowers; none to be seen! Walking back to Dupont, here is a typical row of residential/commercial buildings from the early 20th century. Note the eclectic range of styles – this is a fairly typical block of commercial development and the pastiche of style is a never-ending delight. Across the street is the Washington Club, originally the Patterson House, designed by icon Stanford White in 1901. 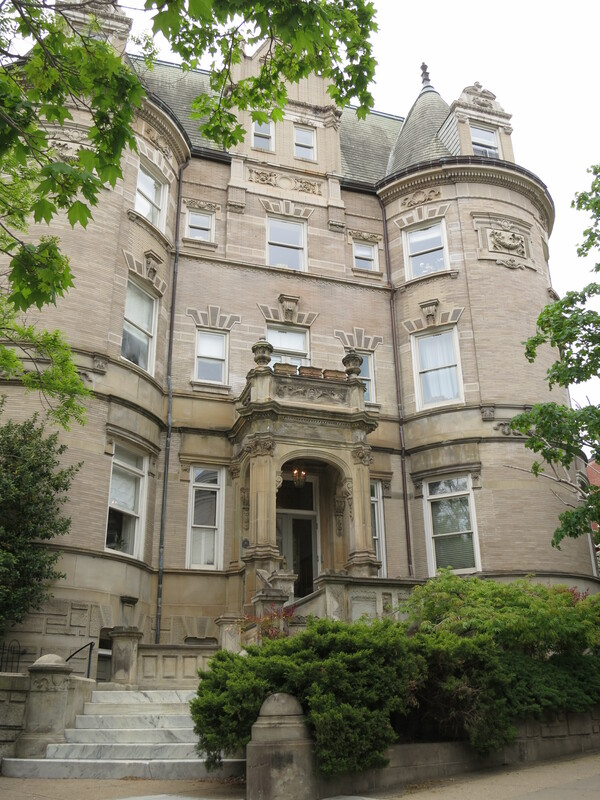 This Italianate mansion was the scene of some bizarre politics during WWII, as Cissy Patterson, heir to her father’s Chicago Tribune fortune, waged an editorial attack on FDR throughout the war years. The only mansion left on the circle, it looks a little lonely and the siting seems a bit odd today. Even so, a nice sunny morning and any Stanford White building will get my undivided attention. And finally, on my way back to the railroad (when rain began to fall), a detail of Daniel Burnham’s fabulous Union Station. This is the “knuckle” arcade between the main waiting room and the former – now shops – concourse room. The detail of this building is astounding. I used to live 3 blocks from Union Station, and would walk in and around it most days. Completed in 1908, it is a massive complex – not exactly pretty – but impressive nonetheless. Daniel Burnham was the “art director” of the World’s Columbian Exposition in 1893, the famous world’s fair in Chicago that introduced the “White City” and celebrated the 400th anniversary of Columbus’ discovery of the western continents. The fair, and this building, were a riot of Beaux Arts white marble monumental architecture. I used to sketch in and out of this building, and it has inspired some details of my own, and a collection of architectural hardware that I designed for Amerock in 2003. So, just a quick Sunday’s walk and some highlights of DC in the springtime. I return to the capitol several times during the year (it is the next city south of my home), so look for more Washington DC architecture in the months to come.